NEW removed off a brand new Toyota Camry. FITS 2015 2016 2017 TOYOTA CAMRY LE LE HYBRID SEDAN MODELS WITH VIN# STARTING WITH THE LETTER "U". LEATHER UPHOLSTERY SETS COMPLT. CLOTH UPHOLSTERY SETS COMPLETE. 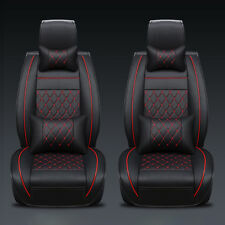 NOTE: These are not slip-over seatcovers, this is custom made upholstery just like the Dodge factory leather upholstery. FITS 2015 2016 2017 TOYOTA CAMRY SE XSE SE HYBRID SEDAN MODELS WITH VIN# THE LAST SEVEN DIGITS STARTING WITH THE LETTER "U". LEATHER UPHOLSTERY SETS COMPLT. CLOTH UPHOLSTERY SETS COMPLETE. 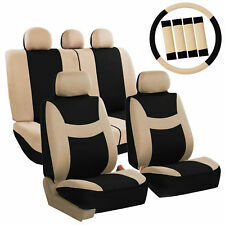 NOTE: These are not slip-over seatcovers, this is custom made upholstery just like the Dodge factory leather upholstery. FITS 2015 2016 2017 TOYOTA CAMRY SE XSE SE HYBRID SEDAN MODELS WITH THE VIN# LAST SEVEN STARTING WITH THE LETTER "U". THIS SET HAS A VERY GOOD LOOK WITH THE SILVER STITCHING THROUGHOUT. LEATHER UPHOLSTERY SETS COMPLT. This kit does not include tools, instructions or supplies (such as hog rings). When installed correctly, these kits can look as good or better than a factory leather interior! Compatibility : 2018-19 Toyota Camry LE and SE. Katzkin kit R2TO41U. 2018-2019 Camry LE/SE. Color is black. fits US models with VIN starting with "4" AND the 7th digit from the end is "U" . Front Seats - buckets. Katzkin kits are intended to be professionally installed, or by those "DIYers" with first hand knowledge of auto upholstery. This kit does not include tools, instructions or supplies (such as hog rings). WILL NOT FIT CAMRY LE/XLE MODELS WITH AN "R" IN THE 7TH POSITION FROM THE END OF THE VIN NUMBER - PATTERN FITS ONLY IF WITH A "U. Driver Seat : Electric and Manual. Passenger Seat : Manual. Fits Cloth/ Leather : Fits Factory Cloth. Driver Seat : Electric. Passenger Seat : Manual. Fits Cloth/ Leather : Fits Factory Cloth. FAST SHIPPING! MAKES A GREAT GIFT IDEA! This leather kit will fit any 2018 and 2019 Toyota Camry SE, OR LE Sedan. The color is RED. IT HAS DIAMOND SHAPED PERFORATED CENTERS. It is made of the finest cow hide. ADD LUXURY TO YOUR RIDE WITH A NEW LEATHER KIT! Whole surrounded design protects the seat well, easy to install, practical. Type: Car Seat Cushion. - Storage bag is designed for front seat which is practical. - Fit most of 5 seat car. 1X Rear seat cover. 1 x Armrest case (2pcs). 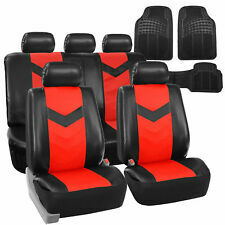 Universal 2Pcs/Set Car Luxury Black&Red Seat Cover PU Leather Front Cushion US. Rear seat cushion: 134x48cm. Front seat cushion: 61x53cm. 2 x Front cushion cover. 1 x Rear long cushion. 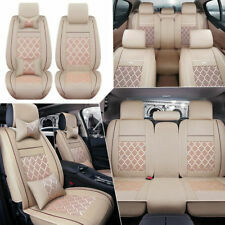 PU leather car full seat cover for M / L size 5-seats car all seasons. Car Seat Covers. Material: PU leather sponge non-woven fabric suede. Whole surrounded design protects the seat well, easy to install,practical. Inflatable car air bed. 1PCS Car air mattress. The air in the cushion can last about 10 hours. Car Steering Wheel Cover. Car Seat Covers. Car Accessories. 1PCS Car air pump. 2PCS Car air pillow. Car Seat Covers. Car Steering Wheel Cover. Car Accessories. 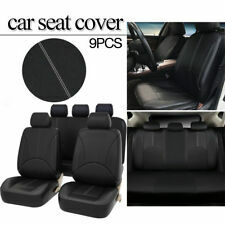 rear row: front seat cushion: 140 49cm backrest height: 59cm. Whole surrounded,protects original seats perfectly. Motorcycle Accessories. front row: front seat cushion: 49 54cm backrest height: 63cm. 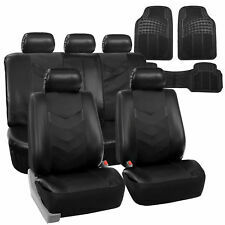 2018 Toyota Camry LE / SE Black OEM seat covers. These are OEM Factory seat covers for a 2018 Toyota Camry SE / LE. In excellent condition but the car was smoked in for a day or 2. The seat covers have an extremely faint smell of smoke. Includes all seat covers and headrest. Black and gray cloth. 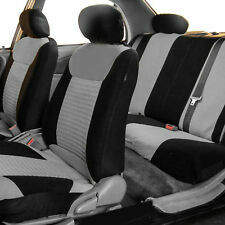 NOTE: These are not slip on seat covers, they are the replacement factory upholstery covers. Great to have in case of spills, tears or replacing your cloth when it gets worn.